Our cylinders are generally manufactured with diameter with 80,120,160,200,250 mm. The manufactured cylinders are then thoroughly tested with speeds up to 4000 rpm und working pressure of 30bar. 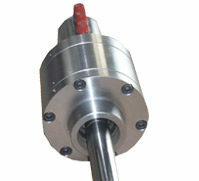 We also manufacture stationary Hydraulic Cylinders used to actuate tailstocks, various Mechanisms on fixture. If our customer requires the customised cylinder; then we also design and manufacture the customised cylinders.